When trying to save money on your household bills you may come to a point when you feel like you cannot save anymore. 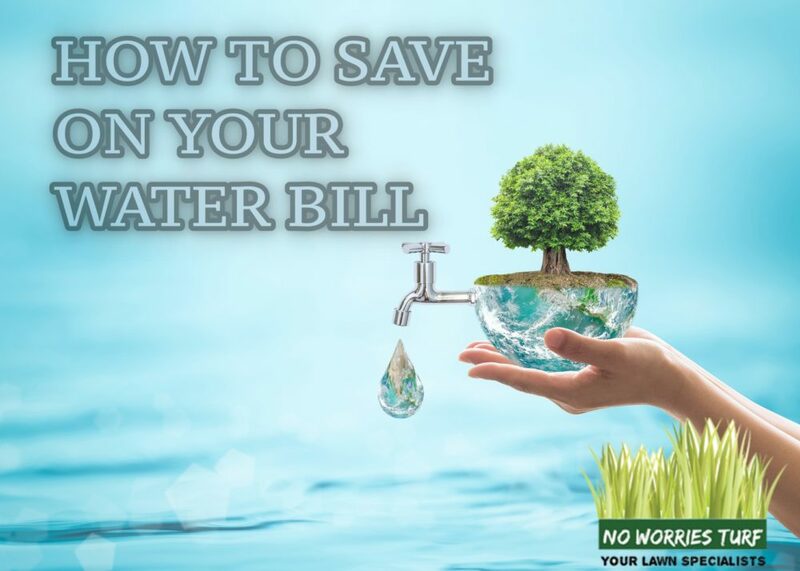 Look again and think about trying to save on your water bill. There are many little tricks that you can do to help you save when you feel like there is no room for improvement. Try these helpful hints and come back in a month or two and let me know if your water bill has dropped. When cleaning fruits and veggies save your water and use to water your houseplants. Run the dishwasher only when it is completely full. Let your frozen foods defrost in the fridge overnight instead of using the running cold water method. When washing the dishes fill your first sink half full with hot soapy water and your second sink half full with hot rinse water. Do not stand there and leave the water running full blast the whole time you are washing dishes. This uses more water than you think. Keep a pitcher filled with water in your refrigerator for drinking water instead of running the tap every time you need a drink. Use the least amount of water when boiling something in the kitchen. Drain and reserve this water and use it to water your houseplants or outdoor potted plants. The garbage disposal in the kitchen can use a ton of water. Use it sparingly or better yet start composting! Take shorter showers…shortening them even by a few minutes can help you save on your water bill. Check your toilet for leaks by adding food coloring to the toilet tank. If a leak is present you should see it in the bowl within 30 minutes. Fixing these leaks is fairly simple; just ask your local hardware store for help. Don’t let your water run down the drain while waiting for the water to get hot. Put the stopper in immediately and adjust the hot water after it starts filling up a bit. Filling the bath up only 1/3 of the way will make a big difference when trying to save on your water bill. Partially fill the sink instead of letting the water run while shaving or washing your face. Cut down on the number of times that you flush the toilet. Use the trash can for toilet paper that is used for blowing your nose or wiping up spills instead of flushing them. Consider buying a water-conserving front loading washing machine. Make sure you adjust the water level to the amount of clothes you have in the washing machine or better yet only wash clothes when you have a full load. Try re-using your towels when bathing. Keep a different color for each member of your household and have them hang it to dry in between uses. Keep your hot water heater on a little cooler setting. This may not save you in the water department but can drastically cut down on your energy bill. Collect rainwater to water your plants. Use a barrel or bucket under your downspout or gutter. Water your grass in the evening to cut down on evaporation from the hot sun. Use soaker hoses to water your flower gardens and plants. This gets the water directly on the spot where needed. Put mulch around your plants to help hold the moisture in and cut down on the number of times your plants will need watering. When the heat is high and your kids MUST play in water outside to keep cool. Try only filling there wading pool halfway and turning the hose down on low with the sprinkler to help save on your water bill. It’s not always necessary to compost kitchen waste before adding it to your soil. So here are a few tips on how you can improve your garden soil without a compost heap using three kitchen scraps you’d normally throw away. Rinse out any egg shells you have and allow them to dry for a few days in a bowl on a sunny window sill or by a radiator. When they are dry they crush very easily. This will help them to break down quickly when added to the soil. 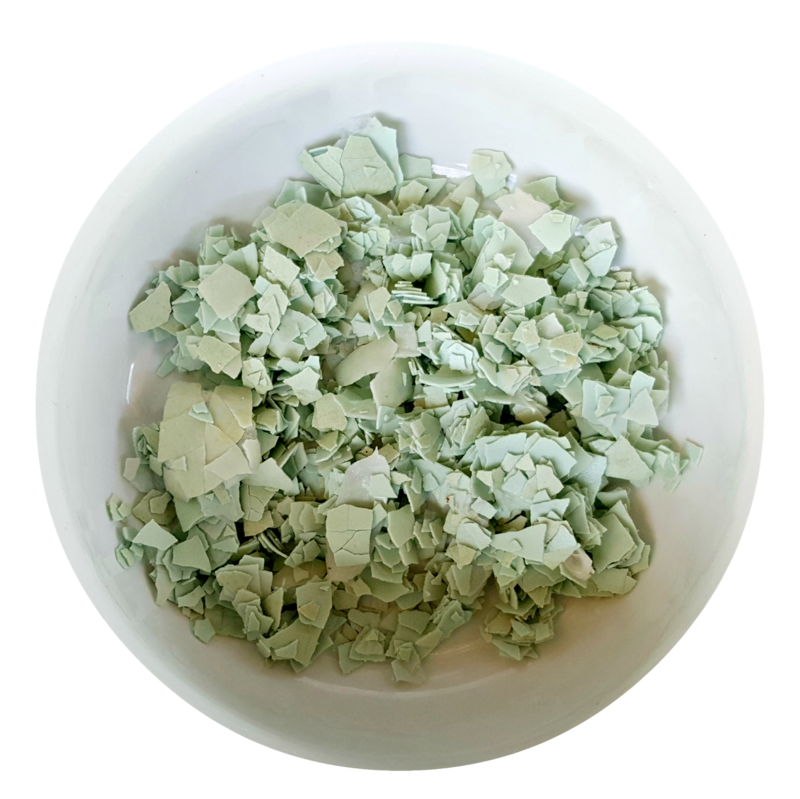 Crushed eggshells improve drainage and the addition of the calcium is excellent for promoting plant growth and preventing blossom end rot in tomatoes and squash plants. If you have an old coffee grinder or food processor this will make short work of it. They are also a good deterrent for slugs and snails. Scatter a generous barrier around any young seedlings to keep the pesky molluscs away. Apparently this is the human equivalent of walking barefoot on broken glass. Coffee grounds can also be added directly to the soil. They act as a general fertiliser, adding organic matter, improving drainage, water retention and soil aeration. As they break down they will continue to add nitrogen which is so good for plant growth. Don’t worry if they look a bit mouldy, this is just part of the natural breaking down process and a sign that it’s working. Adding banana skins is another excellent way to improve your garden soil. They can also be added directly to the ground as long as they are cut up into very small pieces. They’ll break down faster and offer all the micro-organisms in the soil lots more surface area to work their magic. This creates plenty of new organic matter resulting in a light, well drained soil which is full of lovely earthworms. Once the banana skins have broken down they will add a powerful cocktail of nutrients; calcium, magnesium, sulphur, phosphates, potassium and sodium, all of which help plants to grow well and develop their fruit. It’s almost summer which means mosquitoes will be coming out soon. And even when it’s not the warm season, some places can still get them year round, and any type of repellent will do. But you don’t have to spray on toxic mosquito repellent to keep them away. In fact, there are plants that you can grow inside and out to make sure you don’t get bitten. And many of these plants produce essential oils, which means you can keep them repelled wherever you go. So check out these low maintenance plants and start growing! Whether you’re using citronella candles, growing it in a pot, or making it a part of a centerpiece, this plant is definitely a great way to keep the mosquitoes away. Lavender is one of my favorites and is definitely a great way to repel mosquitoes. You can plant this around your entryways or put the lavender essential oil on for any nightly walk. Mosquitoes are out in full force during summer, but thankfully rosemary can stand the heat. In fact, it prefers it. And on a random note, I love growing rosemary since it’s so convenient just to grab a few sprigs and throw them into a pan of fried potatoes. Being related to citronella, lemongrass can look similar, but it’s actually edible! It can grow pretty tall which can make for a great garden design when planned out. 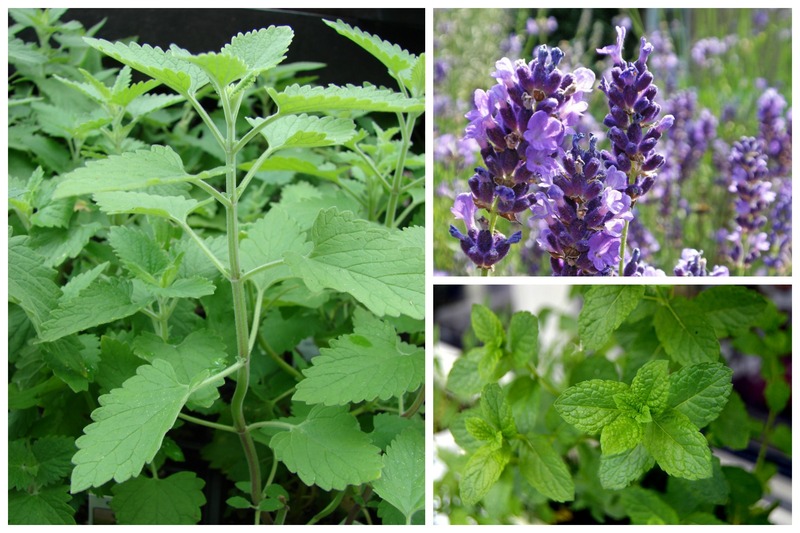 I love the fact that so many of these mosquito repellent plants can be put into recipes. And with that note, feel free to grow some mint, put it in some ice tea, and relax on your back porch. Because you know… if you’re growing mint outside, no mosquitoes are going to be bothering you as you chill. Now I like this one since it repels mosquitoes and houseflies. Feel free to grow it in a pot inside as well so you can break a few sprigs off every once in awhile for cooking. Catnip contains a strong repellent called nepetalactone, and that makes it a lot stronger than other types of mosquito repellent. So definitely try this one out in your yard. Repelling many different types of bugs, you won’t have any trouble with mosquitoes all summer long if this one’s in your yard and house. Not to mention they’re beautiful, so they make a great centerpiece. A nice clean garden edge gives your landscape definition and texture. Of course, we’d all love a professionally designed garden area, but the cost of materials alone can be astronomical. These lawn edging ideas are innovative and beautiful to give you the function and aesthetics without the high costs. You can keep your lawn edging as basic or creative as you’d like based on your location, landscape, and budget. Here are a few ideas to get you started. I love this look, especially for raised beds. You can fill the wall with just about any size of rocks depending on what is available in your area. Use a 12 gauge or thicker concrete mesh roll, for the walls. You can buy these at any hardware store. Using wire cutters, create boxes to your specific height and size. Bury 6×6 treated wood posts evenly along your border. Place the wire boxes between them and fill them with the smooth river stones. Finally wrap the entire wall with one layer of mesh wire, tieing it to the existing boxes. This is a simple idea to create your own edging with cedar wood that is just over six inches high. You could easily make it higher if you need to. Stone makes a good option if you want a more natural look. The idea is simple, but you may need some extra muscle help to carry the stones and place them in the right spots. Stones of universal size work best for this technique. This is a beautiful sleek edging created with terracotta pieces, similar to brick, but with a smooth finish. If you live in an area with several fallen trees, use what you have and create a wall of your own. This is a natural, rustic, old-fashioned look. This is great if your edging area is large. This is by far the cheapest option. Creating a raised garden bed is a great way to create a beautiful garden area and clear edging at the same time. If your wood is touching the soil, make sure it is treated wood, which prevents it from decay. Raised beds also add variety in height, which helps flat yards look more appealing. This is one of the most inexpensive edging options. Flexible metal is easy to install in an afternoon and creates a clean line around flower beds, trees, and property lines. Metal edging also takes up the least amount of space. You can find this at your local hardware store. Simply dig a ditch around the edge of your bedding area and fill it in with gravel. It may take a little weeding to keep stubborn weeds from popping up, but it’s easy to install and inexpensive. You can create a beautiful brick edging without the hassle of plaster or the expertise of a mason. Be sure to add black yard fabric below your bricks to prevent grass and weeds from growing between your bricks. A thin metal railing between the grass and bricks would also give an added stability to your edge. Sometimes you can actually use plants as a plant border. Natural grasses work as a beautiful natural border. This border take the most maintainance, but also is one of my favorites. It may take some time to gather old wheels from thrift stores or flea markets, but wired together they make absolutely stunning edging to your flower bed. Perennial plants have been a favorite in gardens since the first days of the cottage garden, when the benefits of plants that were long lived, easily propagated and generally hardy due to their ability to survive winters by dying back to the ground were of importance to gardeners with little money to spend on gardening. 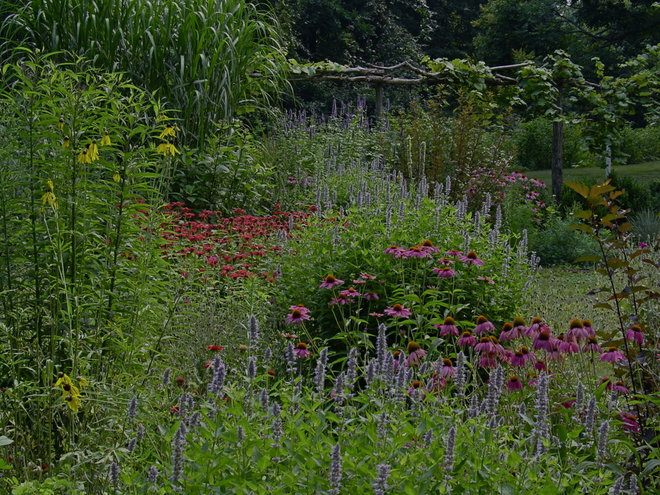 As our gardens evolved, so did our use of perennials. When I was a horticulture student in the 1960s, the traditional herbaceous border featured large in our garden design lectures. 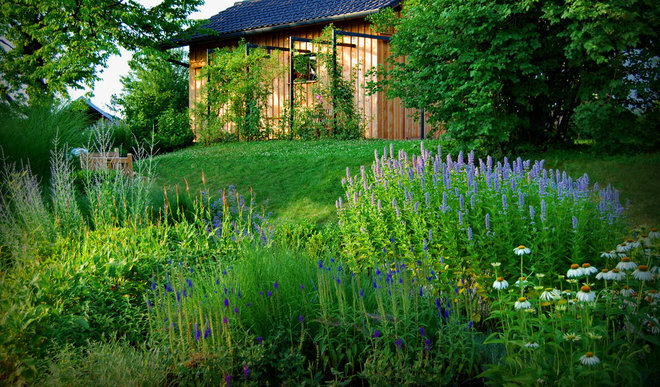 Today, no doubt, students learn more about the naturalistic prairie style of planting perennials, championed by Dutch garden designer Piet Oudolf and landscape architecture firm Oehme van Sweden. 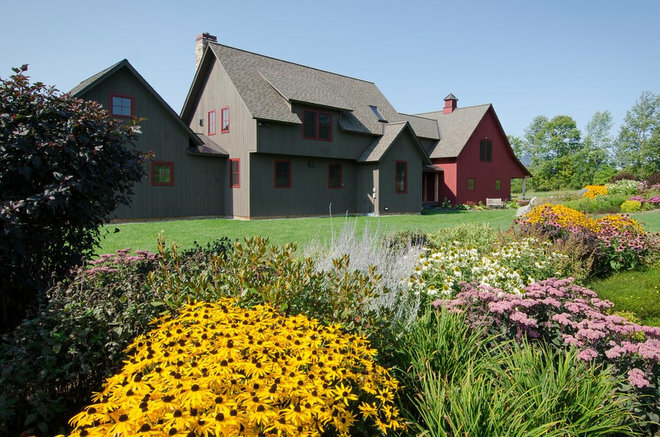 And now there is a third generation of perennial planting, best known by some garden designers — including Michael King, writer and perennials expert — as the “perennial meadow,” which uses the best parts of both the previous formats. The traditional perennial or herbaceous border combines a great variety of plants in drifts and swaths of color linked in a very stylized manner; the more naturalistic prairie style of planting has shown us how to incorporate grasses and perennials grown in conditions closer to those found in their natural state — using the right plants in the right place. Modern perennial meadows are a mixture of colorful perennial plants and grasses that are planted in groups and drifts to create plantings in a naturalistic style, using a restricted planting palette and plants that happily grow together to form a stable community. The perennial border popularized in Victorian gardens was labor intensive and very seasonal, requiring a great amount of horticultural skill to create a stunning kaleidoscope of summer color. Garden designer Gertrude Jekyll included intricate, colorful borders in many of her Arts and Crafts–style gardens. Maintaining these borders required splitting the perennial plants and replanting every three to four years to maintain their vigor, staking and trying to keep plants in order, and deadheading and weeding throughout the season to keep the border tidy. The design of the perennial meadow has changed the way we interact with the plantings. Whereas the herbaceous border was created as a focal point, or a feature to be viewed, rather like a painting, the perennial meadow takes its form from the prairie style, where we are surrounded by the plantings or are led through them by pathways. The perennial meadow gives us the opportunity to use a wide range of plants and grasses to create a stylized version of a traditional meadow that perhaps has nostalgic resonance with our past. 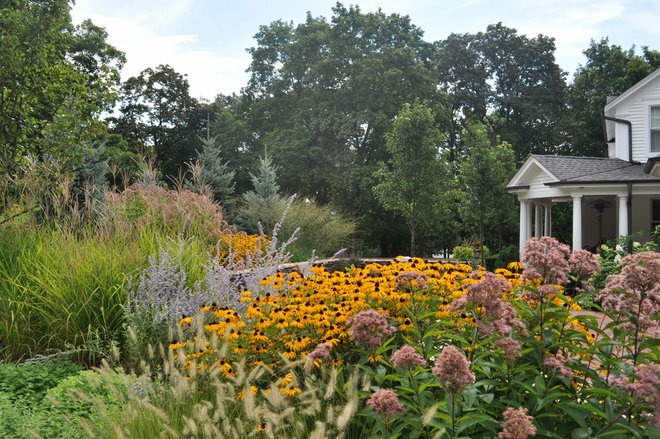 Prairie planting, the second generation of perennial use in garden design, can be seen as a much freer form of planting, using a mixture of perennials and grasses in an open field or prairie. 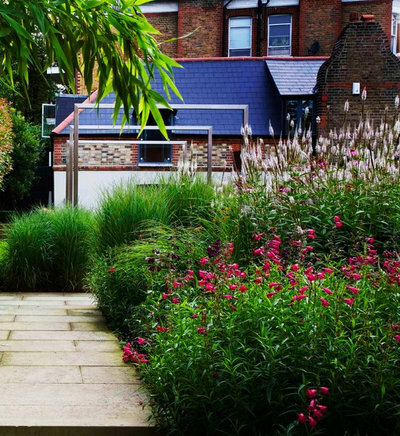 Though spectacular in larger spaces, like Queen Elizabeth Olympic Park, in London, or Lurie Garden, in Chicago, this style of perennial planting can seem formless in the small garden; it’s difficult to implement as a feature within a garden. 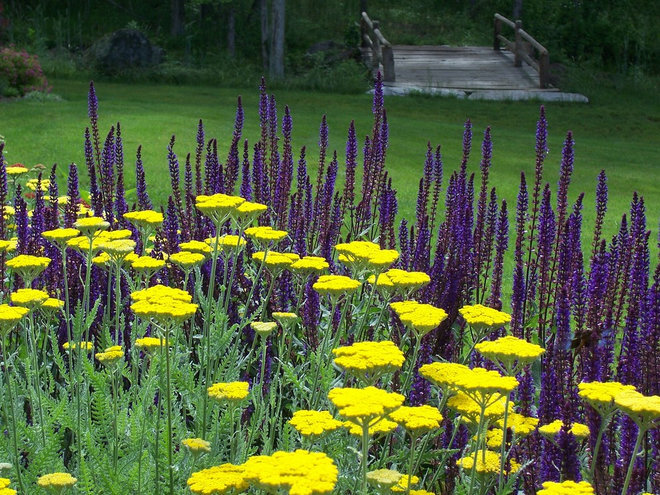 Noel Kingsbury, coauthor of The New Perennial Garden, does, however, suggest that strips of around 3 feet, or 1 meter, across can be planted to effect. The planting of the perennial meadow is a lot freer than in the herbaceous border and prairie planting, with the accent on providing foliage and, especially, flower color through as long a season as possible. There is no attempt to emulate nature, as in prairie-style planting, but to create an association of plants that will happily grow together, in swaths and drifts, interlocking as they do in nature. Here we can see how drifts of intermingling plants almost emulate nature in the way they grow in this perennial-meadow style of planting. Both the meadow sage (Salvia xsylvestris ‘May Night’) and fern leaf yarrow (Achillea x ‘Moonshine’) used here are improved cultivars of very common native plants that retain the natural form yet have better flower quality and a longer flowering season. One of the benefits of this generation of planting is being able to use a wide range of plants, not necessarily native to the zone or country, but because they suit their position in the overall design. Planting a perennial meadow requires the same skill in plant placement as other forms of planting do, including the techniques of grouping and repetition. The black-eyed Susans and pink sedums in this long border are planted in groups and repeated, creating a visual link along the border. The planting is tight to form a low-maintenance ground cover that gives the impression of a living tapestry of color and texture. Because more modern compact varieties of perennials and tight plantings were used, there is little need for time-consuming tying, staking and weeding of plants in season. Though not natural, as prairie planting also isn’t natural in the true sense, perennial-meadow-style planting can also have environmental benefits. 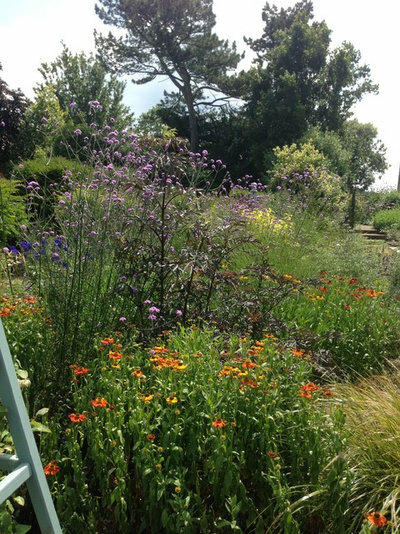 A mixture of grasses and flowering perennials provides habitat and food for a wide range of insects and birds, while having a low environmental impact. Any cutting back of flowering stems should not be carried out until the spring, to allow birds to enjoy the resulting seed heads while they use the dried foliage for nest building. Earlier this summer I visited Bishopscourt, the garden of the Bishop of Rochester, in the southeast of England. At the rear of the garden, where there had once been a traditional parterre, now stands a wonderful example of a perennial meadow. 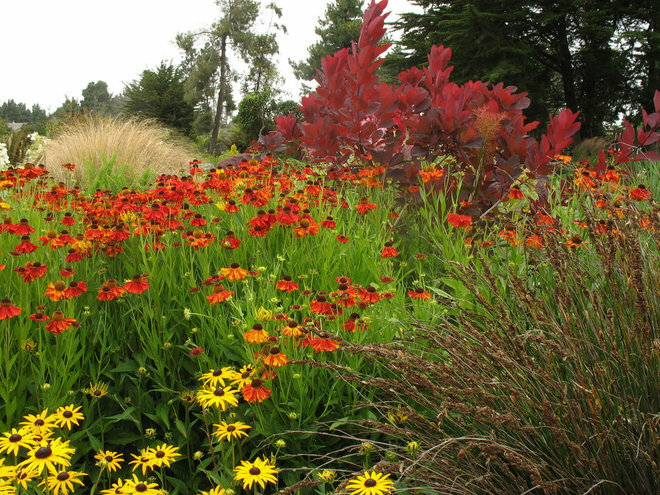 Flowering perennials and tall grasses intermingle in a profusion of color. This planting requires less maintenance than the traditional parterre would have and provides color throughout a longer season and additional environmental benefits — on my visit the border was alive with butterflies feeding. Garden styles and systems can never be set in stone, and this includes the use of perennial plants. Future garden designers may choose to go back to the formal layout of the traditional herbaceous border and cast aside the more flowing lines of the perennial meadow. 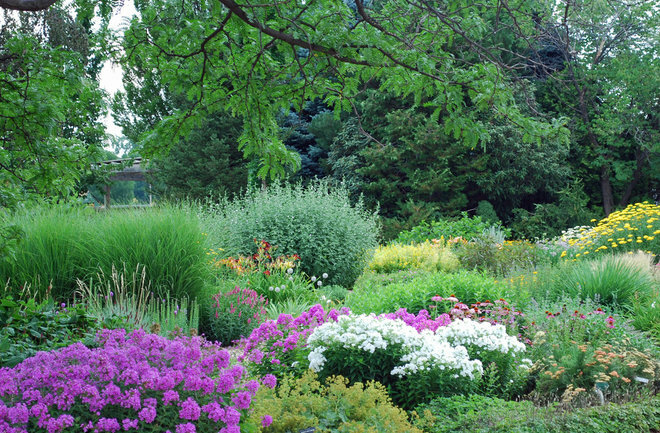 We may even see these styles combined, as with the long perennial border in the contemporary garden seen here. All you need is one simple ingredient… coffee grounds. Chances are, you probably already have some coffee grounds sitting in your kitchen cabinet right? Well, put them to good use by making this incredible mosquito repellent. Soon your home will become a mosquito free paradise. Below you will find a video tutorial on how to this method to keep mosquitos away. This technique is also effective in repelling other insects such as wasps, flies, and midges. 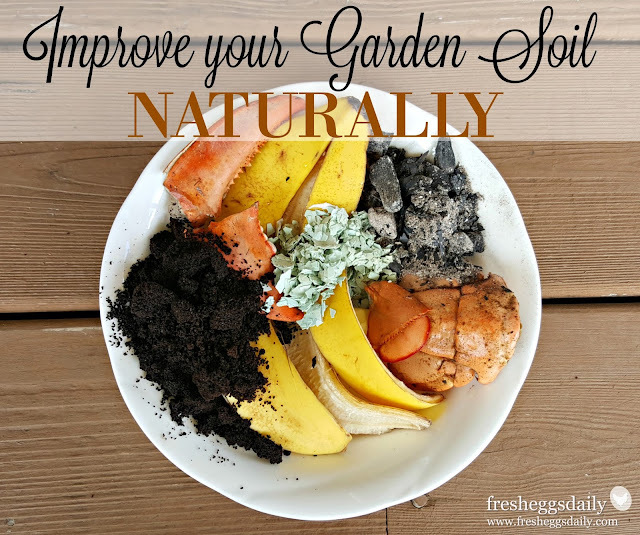 Instead of using commercial fertilizers and plant food, why not use some scraps from your kitchen that would otherwise end up in the trash or compost bin to amend and improve your garden soil naturally? Inexpensive and easy, these are my favorite ways to get my garden ready for spring planting. The better your soil and the more suited for planting, the more bountiful harvest and more lush blooms you will get. So making sure your garden soil includes the proper nutrients is critical to having a successful garden. Of course, all these things can be added to your compost pile, but since they each possess some really great nutrients for specific situations, why not spot apply them to your garden where they are most needed. Here are my favorite natural (and free!) ways to improve your garden soil makeup. 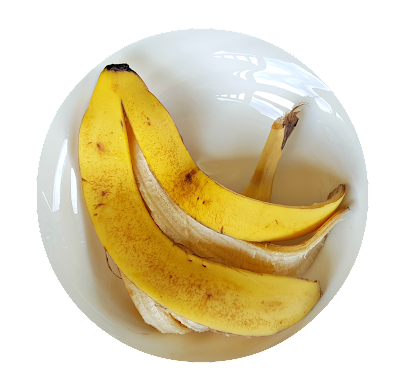 Banana peels are extremely high in potassium and also contain sulfur and phosphorus. Chopping up some peels and putting them around the base of your vegetable plants will help with root development, to increase the flower blooms on your plants, and therefore your fruit yield. Chicken feathers are very nitrogen-rich. Collecting some feathers from around your coop and run (think during the molt season!) and adding them to your soil will provide the nitrogen necessary for nice green leaves and provides food for your plants. The leafy greens such as spinach, kale, broccoli and others are especially appreciate of high nitrogen levels in the soil. Don’t toss those coffee grounds! They contain nitrogen, potassium, and phosphorus, making them an excellent general fertilizer for your plants when you sprinkle them around the base of your plants or work them into the soil prior to planting. Save your eggshells too. If you normally feed them to your chickens for the supplemental calcium they need to make strong shells on the eggs they lay, save some to use on your garden. Not only will adding some crushed eggshells to the hole when you plant tomatoes, peppers and other vegetables that require high calcium levels help to prevent blossom end rot, sprinkling some around the stems of your plants deters slugs. Epsom salts are extremely high in magnesium which helps seed germination and the absorption of other nutrients. Mixing some Epsom salts into your garden soil will help your seeds sprout. Diluting the Epsom salts with water and spraying the mix onto plant leaves should result in greener leaves, bushier plants, and more flowers. 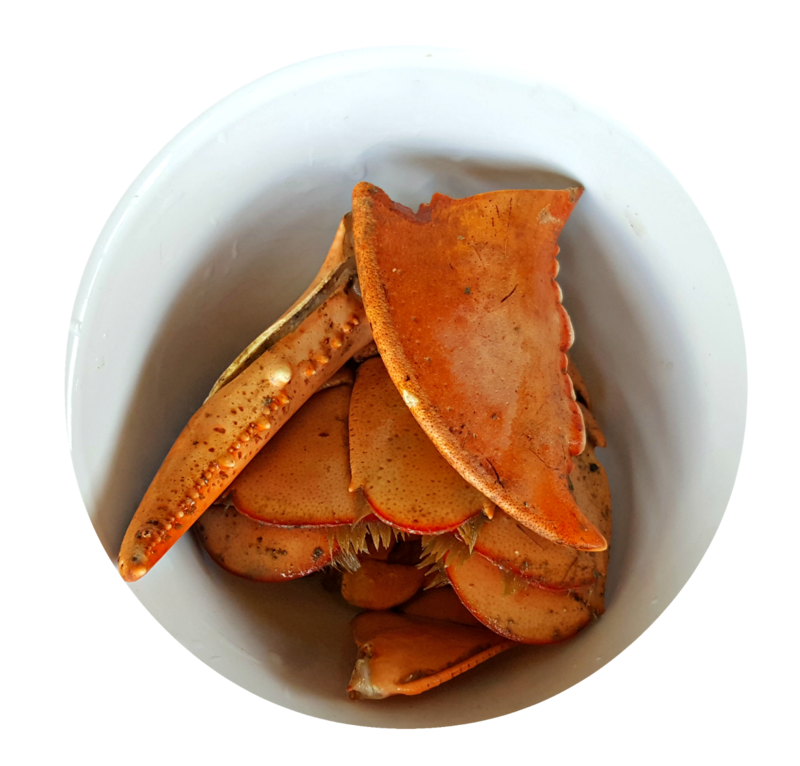 Tossing your discarded shellfish shells in the garden not only adds nitrogen and phosphorus, they will make your acidic soil slightly more alkaline, which is more conducive to growing vegetables. If you have a wood stove or fire pit, saving the ashes and scattering them on your garden will help to neutralize acidic soil and also add calcium to your soil. Depending on the types of wood burned, wood ash also can contain high levels of magnesium, potassium, and phosphorus which are all beneficial to a garden. So next time you’re on your way to the trash bin or compost pile, think instead of what you’re tossing out might work better to help feed your garden. 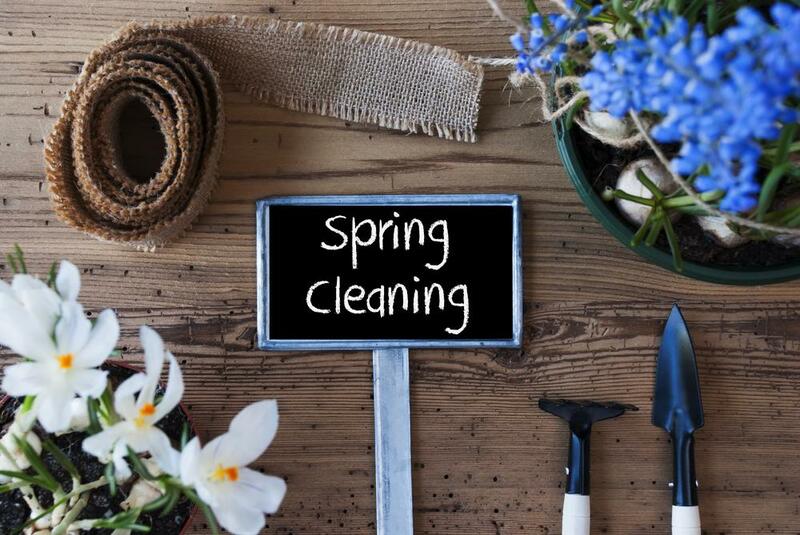 Now spring is here, many people will be looking to cleanse their home with a nice spring clean. However, why just stick to cleaning inside the home? Over the last few months, your garden will have faced some horrendous weather and it may be looking a little worse for wear, which is why it may also need a little TLC and a spring clean. Your grass will have taken the brunt of the weather so you may want to consider installing artificial grass, but it won’t just be the grass you will need to check the condition of, you should also give any flowers and trees a once-over, too. If you’re not sure where to start these tips should help you with your garden spring clean. In the last few months, we have seen high winds, snow, rain and not a lot of sun. Because of the wind, you may find that rubbish and other debris has been blown into your garden. So the first thing you will need to do is to remove this. It won’t take long and when all the twigs, leaves and other rubbish is gone you will be able to see the garden more clearly, enabling you to decide what needs doing. With the various weather changes, there will be nothing in your garden worse hit than the grass. It will have taken the full brunt of the cold weather and with that, it may not be looking its best. Of course, you can fix this and let it grow but you will be back in the same position this time next year. To avoid this never-ending cycle, you may want to consider investing in artificial grass. It’s low maintenance, pet and child-friendly and when winter comes and goes, your grass will still be a lusciously green colour. However, it’s not just the grass that will have been affected of the last few months. Your plants and trees may also be looking a little sad. You can try to recover them but they may need replanting in a different area of the garden, especially if they aren’t getting enough light. If they look too bad and beyond repair, it might be best to plant some new flowers and trees. Of course, it will take time for them to grow, but it will be worth it in the end and, alongside your new grass, they will look stunning. This will apply to anyone that didn’t place any garden furniture in storage during the winter. As we all know, the elements can be cruel and any furniture left outside will bear the marks from the bitter cold. It could be some rust on the BBQ or peeling paint on any wooden furniture, either way, these are both things that can be fixed, that is if it’s not too bad. You can re-paint any of the furniture and treat any rust on your BBQ so that it’s all ready for the coming summer months. But you must remember that if you’ve invested in artificial grass, the BBQ cannot sit on top of it as it will damage the grass. Now you know exactly what to do, all that’s left is to go and spring clean your garden. Remember your garden is open to the elements so don’t be too surprised if there’s damage. Try and avoid being in the same position next year by opting for artificial grass and covering any garden furniture and plants. Don’t waste your springtime cleaning next year, spend it enjoying your garden. nine different ways? Then you’ve come to the right place. household, try to plant your garden away from your outdoor tobacco area. materials into the garbage, head outside and sprinkle them in your garden. with annuals which can survive on about two watering days a week. plants. Plants, like people, can be very very picky. gardening tools for the jobs and take good care of them by washing them after each use. pests, harsh weather conditions and playful pets can all affect the growth of your garden.